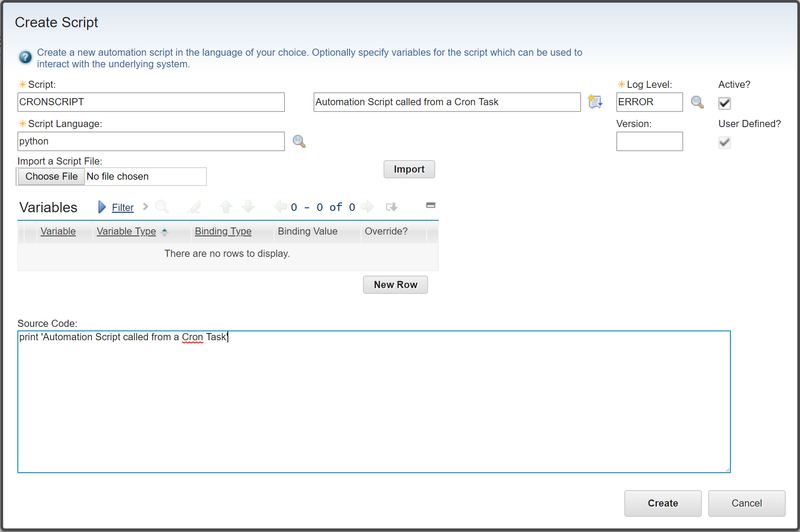 Cron tasks are jobs that run automatically on a fixed schedule within Maximo. They include important jobs such as the PM Work Order Generation Cron Task, the Inventory Replenishment Cron Task, and others. There may be times when you come across some requirements where creating your own Cron Task provides the best solution. In previous releases of Maximo, it was required to write a custom Java class to perform the action of the Cron Task when the schedule came due. Therefore, many times we turned to Escalations to provide solutions where scheduled tasks were required. 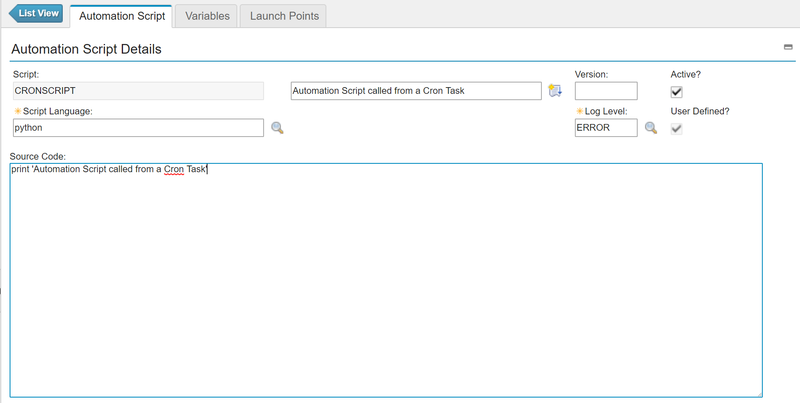 In Maximo 7.6, you can now run an Automation Script directly from a Cron Task. This article will walk through how to configure this. From the Select Action menu, choose the Create > Script option. arg: This is a delimited list of arguments that you wish to pass into the script. We will show below how to populate the arguments when we create our Cron Task. runAsUserInfo: This variable gives the script access to the user profile that the cron task is running as. This will allow you to fetch Mbo Sets or perform other tasks with a set of credentials. instanceName: While this variable is not utilized in the above script, it represents the Cron Task Instance Name that the script is being called from. This could be useful in the cases where you have multiple cron task instances and need to distinguish which one is actively running. You can utilize the MXServer.getMXServer().getMboSet() method to fetch MBO sets of any record set that the runAsUserInfo profile has access to. Please note the strategy for closing MBO sets when you are finished with them. This alerts the JVM that the object is ready to be garbage collected. It’s important to follow this strategy, or a similar strategy, to avoid potential memory leaks with the JVM. Now that we have a script, we can create a Cron Task to call it. Navigate to the System Configuration > Platform Configuration > Cron Task Setup application. Click the New Cron Task Definition button on the toolbar or under the Common Actions menu. There should be two new parameters in the Cron Task Parameters table at the bottom of the page. SCRIPTARG: This parameter is used to pass in variables to the script. You can separate variables by a comma or other delimiter in order to pass in more than one variable to the script. SCRIPTNAME: This parameter tells Maximo which Automation Script to trigger when the cron task runs. Fill out the above parameters and click the Save button. The SCRIPTNAME parameter is required, but the SCRIPTARG parameter is optional. At this point, the Cron Task is configured and ready to go. When the cron task runs it will call the script with the arguments specified in the parameters table. Question: The argument values defined at Crontask SCRIPTARG and also in the script itself. So since the argument values are defined (hardcoded) in the script, what is the value at SCRIPTARG for? The SCRIPTARG Cron Task parameter is converted into an implicit variable in the Automation Script called arg. This variable can then be utilized in the script. For example, you might have a script that has slightly different behavior based upon which Site you’re operating on. You can use the SCRIPTARG parameter to pass in the Site ID for the current Cron Task Instance. A different instance on a different schedule might be for a different Site. Rather than having two scripts that do mostly the same thing, you can pass the Site ID into the one script. Hopefully this helps.